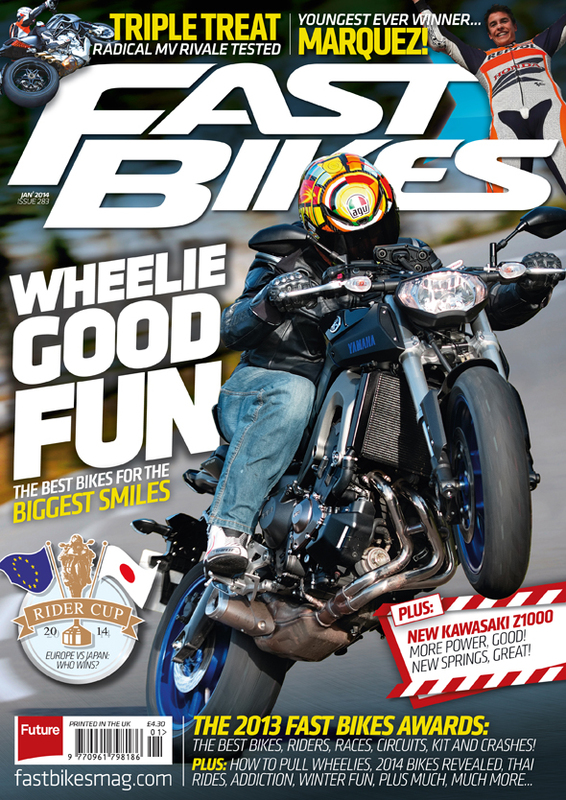 Fast Bikes Magazine January 2014 – OUT NOW! Yep, your weekend has been saved. 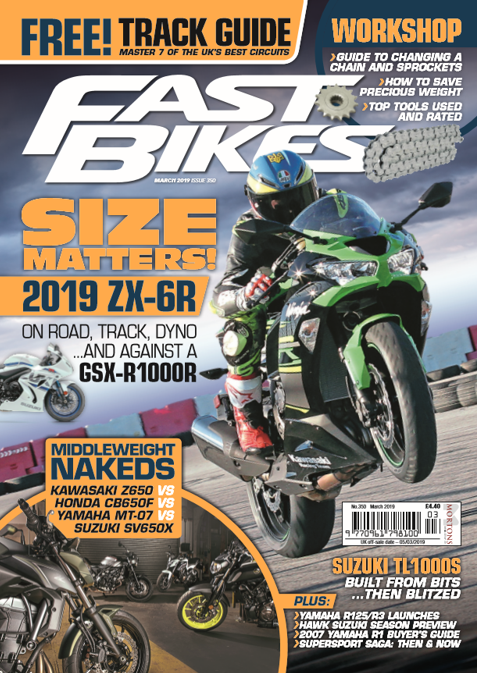 Yep, the January issue of Fast Bikes Magazine – also known as issue 283 – will be fresh in the shops over the weekend and is brimming with the latest and greatest 2014 bikes, slightly older bikes, amazing features and all the usual Fast Bikes awesomeness. Digital editions, in all formats, will be available on the 10th of December. It’s wheelie good fun this issue. The cover leads with the best bikes for the biggest smiles, with Rootsy on Yamaha’s MT-09. We pitched the new Yam against like-minded middleweight hooligans: Triumph’s Street Triple, Ducati’s Hypermotard and KTM’s 690 Duke compete for core test honours. Plane crazy! 2014’s new metal is stacking up thick and fast, and we get to sample the updated Kawasaki Z1000 and MV Agusta’s intriguing Rivale: another stunt king and another bike to add to MV’s ever-growing range. A new feature starting this month is the 2014 Fast Bikes Rider Cup, pitching the best sportsbikes Japan can offer against those from Europe. This in-depth intro analyses everything from electronics, to service intervals in preparation for next month’s official tee-off. Needless to say, we’ll be ripping up the Tarmac and offering the most informative, impartial tests around! Continuing with the wheelie theme, we’ve got a barrage of wheelie good features this month. Charlie attended the Learn2wheelie School at Dunsfold and returned with new skills, and clean pants. And there’s the ultimate wheelie glossary – The Fast Bikes A-Z of wheelies! As 2013 comes to a close, we bring you this year’s Fast Bikes awards – everything from girls, to crashes, to rubber and much more! And as we creep closer to Chrimbo, there are a few last minute stocking-filler ideas in our Products pages to ease the pain. As well as the regular slots (FB’s longterm fleet, Bruce Smart updates, Project Bike shenanigans, Tracks & Travel, and the gorgeous Emma with a gorgeous carbon-clad BMW in Addiction) there’s an insight into how, why and when to take a photograph from our (almost) in-house snapper, Jonny Gawler. Talking of snappers, there’s also an exclusive interview with one of WSB’s stalwarts – Kel Edge spills the beans. And you couldn’t survive until Xmas without FB’s racing section. As well as Parrish, Chaz Davies and Joe Francis (British Moto3 champ) columns, we look into Marc Marquez’ incredible rookie season and highlight the other rampaging rookies from previous years.